Baby shoes have always been thought of as cute and lasting mementos of a baby's early days. In the past, parents even bronzed their children's shoes as forever keepsakes. 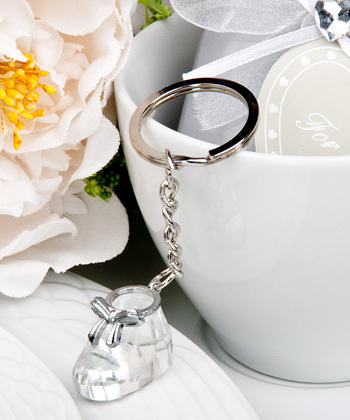 So, Fashioncraft came up with this sparkling little charmer so you can give your guests a baby shoe that fits right in their pocket and is sure to make them smile. 2016 Weddingstar Catalog | Personalized Favors | Bridal Shower Favors | Baby Shower Favors | Baptism & Communion | Coupon of The Month | Deal of the Month | New Arrivals! | Best Sellers | Bridal Gifts | Bridesmaid Gifts | Place Card Holders - Photo Frames | Favor Boxes and Containers | Practical Keepsakes | Unique Wedding Favor | Theme Weddings | Favors by Season | Wedding Reception | Wedding Ceremony | New Born Baby Gifts | Wedding Stationery Sets | Anniversary, Graduation and Sweet Sixteen | Make a Payment | | New Items | All Items ©2004 - 2019 SuperGiftPlace. All rights reserved. Powered by Shoppe Pro.